KTM 250 Duke is the latest bike on KTM. It has aggressive look. Its rival includes FZ 250, Benelli 25, CFMoto 250. 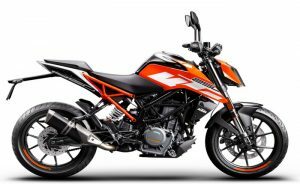 The KTM 250 Duke gets the new 390 Duke’s frame and body work but misses the all-LED headlamp. Instead, it gets a similar-shaped headlight with a regular halogen setup lined with an inverted U-shaped DRL. It is the liquid-cooled and fuel injected motor that essentially is a downsized engine block from 390 duke. In this bike power does not come in a gush, rather a smooth flow with a much stronger midrange than the 200 Duke. Slipper clutch is installed which makes easier to control the bike while downshifting the gear. This bike also gets the revised riding position which is even more comfortable than in Duke 200. KTM 250 Duke is also suitable for off-road riding since the suspension is even better compared to Duke 200. The major thing about this bike is that it lacks ABS.